Global FinTech financing hit a new record in 2017. We saw the biggest FinTech funding jump in Europe – the growth over 120%, yet US early stage FinTech deals fell as investors made more concentrated bets. Early-stage FinTech deal share dropped to a 5-year low in 2017 according to CBInsights latest report. There’s also been a sharp increase in later stage FinTech funding by corporates backing nearly half of the deals. Is this enough evidence to say that investors are pulling away from early stage FinTech Investing? Why have we seen the rise in corporate scale-up programs? Where is FinTech funding heading in 2018? What are the FinTech trends to Watch next? What's VCs take on cryptocurrencies? For the second episode of our "Let's talk..." vodcast series, we've invited an expert from Travelex as well as two startups from our FinTech & CyberSecurity 2018 program Klippa App and Stampwallet to talk about FinTech for Retail and corporate startup collaboration. We gathered together two startups from the Startupbootcamp FinTech & CyberSecurity 2018 program (Westgate and Gyomo) and two experts from our partners (Comsec and Rabobank) to discuss how startups and corporates can collaborate in the Cybersecurity space. 2017/2018 will require the Financial sector to devote resources to regulatory change including MIFID II, PRIIPS and GDPR, as well as to the challenges posed by the UK’s decision to leave the European Union. FinTech companies offering RegTech solutions will find themselves in huge demand during 2017 and beyond. RegTech is already helping banks to improve compliance and cut costs. More than a third of financial firms continue to spend at least a day in a week to track and analyse regulatory change. It's time consuming, costly, and risks are inevitable. These are just some of the reasons why RegTech is getting so much attention and recognition in financial services industry around the world. 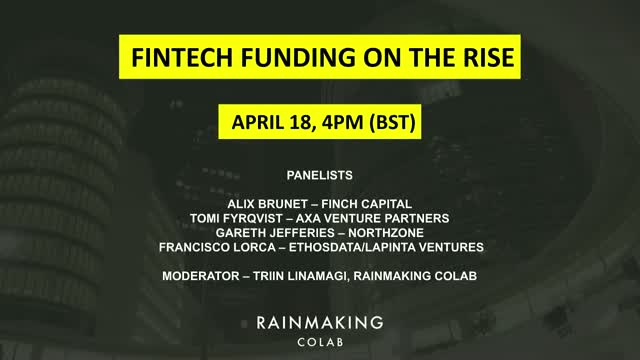 On this webinar we will discuss why the rise of RegTech in banking is the next big thing, what are the challenges of implementation and what RegTech solutions are out there already. Most importantly - are financial institutions and banks considering them already? As the fintech industry continues to mature, new segments are taking the lead when it comes to growth. With leading FinTech companies commercialising their services at pace, both independently and in collaboration with incumbents, the change is becoming real. While a few years ago FinTech companies were seen as a threat to incumbents, we are now seeing more focus on collaboration. Innovation in AI, big data and blockchain are opening up new avenues of growth and focus on specific customer pain points. Startupbootcamp FinTech London and PwC have launched new FinTech Trends Report 'The startup-up view: a year in FinTech' revealing how fintech ecosystem evolves. - Brexit effect: Despite Brexit, should UK remain a global FinTech leader? The terms neo bank, challenger bank, and digital bank have been thrown around a lot in the FinTech space. Attend this panel session to get the full low down on what exactly these are, what differentiates them, and what impact they will have on the banking space. -Where are we in the innovation lifecycle? -What are some of the challenges (business model, customers expecting free services), etc? -What should incumbents be doing to keep their customers happy with all the new competition? With programs and leadership in major startup hubs including London, San Francisco, Singapore, Berlin, Amsterdam, and many others, our leading experts provide first-hand industry insights and give you the latest trends in tech.